Introduction of the "Yamaha Eco-Products program"
Yamaha Corporation (Headquarters: Hamamatsu, Shizuoka Prefecture, Japan; President and Representative Director, Takuya Nakata; hereinafter, Yamaha) has promoted the development of environmentally friendly products in the Yamaha Group as a whole to contribute to the creation of a sustainable society. To further these environmental initiatives, Yamaha announces the introduction of the Yamaha Eco-Products program. The Yamaha Eco-Products program is an initiative aimed at certifying environmentally-friendly products that meet standards established by Yamaha. 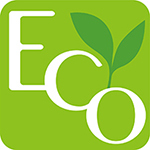 The Yamaha Eco-Label (shown on the right) is attached to those products certified as Yamaha Eco-Products. The aim of the program is to provide customers with environmental-related information and facilitate their identification of our products meeting these standards when they select items to purchase. To promote the development of eco-friendly products, the Yamaha Group has set "Product Environmental Quality Objectives" that take account of environmental preservation, sustainability of materials supply, value for consumers, and other qualities. Those products that meet these standards are specially certified as Yamaha Eco-Products that make major contributions toward realizing these objectives. In comparison within the same product category of in-house manufactured products, the product is found to have remarkably enhanced*1 environmental performance*2 compared with the base year*3 or benchmark value*4. In the same product category in the industry, the product is found to have been designed to have the top quantitative environmental performance. In the same product category in the industry, the product is found to be designed to have not just standard, but excellent qualitative environmental performance. The product has received third-party certification or an award for environmentally friendliness. *2: The environmental efficiency, defined as product performance and environmental load, is acceptable. *4: As based on specified values, guideline values, legal standard values, voluntary standard values, etc. Going forward, plans call for increasing the number of such products from time to time.